Entrance to the Egyptian Court, designed by Joseph Bonomi and Owen Jones, at the reconstructed Crystal Palace exhibition hall in Sydenham Hill. 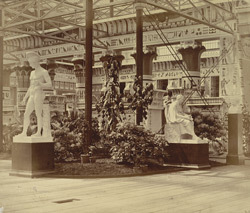 The building, originally designed by Joseph Paxton, housed the Great Exhibition of 1851 in Hyde Park. It attracted more than six million visitors to a showcase of the century's technological and artistic achievements. P H Delamotte's photographs of the rebuilding of Crystal Palace (1852-1854) leave us with a unique record of Victorian Britain at the height of the Industrial Revolution.